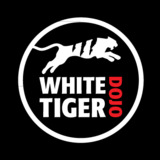 White Tiger Dojo provides martial arts instruction to all ages. Students in the Dojo practice a traditional style of Okinawan Karate called Isshin Kempo. This style of martial arts is unique to Okinawa and played an important part in defending the Okinawan farmers and fisherman from the invading Japanese samurai. Today, they use these same martial principles to teach people how to defend themselves in the modern world. Sensei Darren uses the three pillars of discipline, awareness and organization to unlock his students from stress and allow them to begin re-balancing their lives. The Isshin Kempo method of karate, as Sensei Darren explains, helps students learn how to keep, “the direction of one’s heart and mind firmly within one’s grasp.” From Kinderkubs classes to adult classes, the White Tiger Dojo aims to reduce stress and restore peace, balance, and joy in the lives of students through martial arts.